The M41 Walker Bulldog is an American tier 8 light tank. A further development of the T37 experimental tank. Underwent trials in 1949. In 1950, the contract for mass production was signed. The tank was produced by the Cadillac Motor Car Division, a division of General Motors. The M41 Walker Bulldog leads to the T49. Shoots APCR as default ammunition on both guns. The ammo rack is located directly behind the frontal lower glacis. Crew members are easily taken out. No longer possesses the 10-shot autoloader it was renowed for. Low caliber gun makes it near impossible to cause module damage to enemy tanks. The high-powered 76mm guns originally included the T91E5 10-shot automatic loader, one of the best automatic loading guns on any Tier 7 light tank and all light tanks in general. Unfortunately, with patch 9.18 this has been reduced to six shots, while keeping the same reload time and it was subsequently removed altogether. You might want to mount "Wet Ammo Rack" equipment or take on "Safe Stowage" skill on your loader to reduce the risk of an ammorack detonation; the ammunition rack is rather fragile. You should never point the front of your tank to any mediums or heavies you meet, as getting hit dead-center as stated in the cons will damage your ammo rack. Keep your side to the enemy as your tracks can sometimes protect you from any damage at all. This tactic is assisted with "Enhanced Suspension". However, rely on this tactic as a last-resort; you are a fragile tank whose armor can easily be perforated by low-tier automatic cannons. The best overall strategy is to avoid getting shot at; fragile modules, easily wounded crew members, thin armor and low hitpoints compared to other vehicles are incentives to avoid getting shot at. Use your 400m view range, 30+ hp/ton power-weight ration and 68kph top speed to reach aggressive spotting positions, detecting the enemy as they come. Once spotted, retreat and spot elsewhere. As the game wears on and filled with wounded tanks and gaps appear in the battle lines, exploit these in a typical light tank fashion, savaging isolated and wounded tanks and hapless artillery. If necessary, use this to capture a base; if there is no light or fast medium tanks, they will react rather slowly. 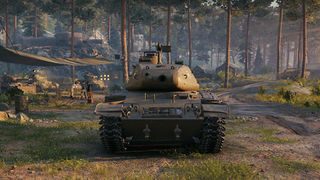 Passive-aggressive tactics are the best for this vehicle in the initial stages of the battle; use your speed to get to aggressive forward positions but remain concealed, spotting enemy vehicles. If they are distracted by larger opponents, use your excellent 76mm gun to land distracting shots into vulnerable side and rear armor. This distraction could allow stronger tanks on your team to overwhelm them while they attempt to engage the new threat you have became. If you encounter opposing lights, assess the situation. If you are outnumbered, outgunned, or have little, if any, support, retreat! Use the speed and maneuverability that got you there to get out of there. If the opponent is outnumbered, outgunned or you have superior support, engage them in a tank melee. After the initial slugging match, engage gaps in the enemy line to savage the weak, isolated or unaware; lone heavy tanks which survived the slug fest, camping tank destroyers and artillery are prime targets. If it is tactically suitable to cap, such as to bait opponents or to win a game, then do so. If it is not possible to engage opponents from the front, then the sides and rear are good areas to shoot; while there are many tanks with impenetrable front turret or hull armor, there are very few tanks with enough side or rear armor to bounce your shots without severe angling. Avoid at-tier or higher-tier medium tanks in all scenarios if possible, especially those of the Soviet, Chinese and American variety. While they may not have your mobility, they have enough to render yours less relevant. They are also most likely better armed, more durable and better armored than you. Engage them only with proper support or in an ambush. Overall, and quite sadly, the Patch 9.18 reshuffle of light tanks has reduced the Walker-Bulldog from being one of the best light tanks in the game to being severly underpowered. 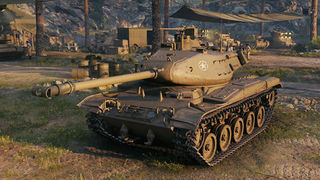 Having moved from tier 7 to tier 8, the Walker-Bulldog effectively gets the same matchmaking as before, but the removal of its autoloader has been one of the most crippling factors this vehicle has suffered. Nevertheless, it is a capable tank and for that, it sees Clan War use, along with its premium equivalent, the German leKpz M41 F 90mm GF, which is vastly superior to it when it comes to firepower, owing it to its larger caliber gun and also by being 4km/h faster. If you have played equal American tanks before you might have radio and engine already unlocked. If not, the stock engine is good, so engine can be researched last. Before unlocking the autoloader you will be under-gunned. So tracks and autoloader gun should be your main unlock goal. The second gun first (for more alpha damage), then tracks, and finally the autoloader. After that unlock the rest in your preferred order. If automatic loaders are not preferred, then it is possible to research everything with the stock tracks. Focus on the armament and turret for the 76mm Gun M32, as it does not add any weight on the vehicle and adds 25mm of penetration and the use of APCR and HEAT in exchange for a loss of rate of fire. The top turret can be mounted with the stock suspension, and adds 20 meters of view range. Then the radio should be researched, as the stock engine is very good and only adds 50hp, where the upgraded radio adds 335 meters of extra radio range. Once the radio is upgraded, the engine can be upgraded, as it weighs the same as the stock engine. The tracks, while not necessary unless mounting the 76mm Gun T91E5, improve maneuverability and ground resistance and is worthy to research. Finally, unlock the autoloader. The M41 Walker Bulldog was a U.S. light tank developed to replace the M24 Chaffee. It was named for General Walton Walker who died in a jeep accident in Korea. On 7 November 1950, the US Ordnance Committee Minutes (OCM) issued item #33476, redesignating the heavy, medium, and light tank, according to the armament; the 120mm (heavy) Gun Tanks, 90mm (medium) Gun Tanks, and the 76mm (light) Gun tanks. While the M24 Chaffee was a successful design, its main gun was not effective enough against well armored opponents. Although the primary mission of a light tank was scouting, the U.S. Army wanted one with more powerful armament. The development of the new tank, T37, began in 1947. The vehicle was designed to be air-transportable, and the desired anti-tank capabilities were provided by installing a long 76 mm gun with an advanced rangefinder. In 1949, with the adoption of a less ambitious rangefinder, the project's designation was changed to T41. Production started in 1951 at Cadillac's Cleveland Tank Plant, and by 1953 the new tank completely replaced the M24 in the United States Army. Initially it was nicknamed "Little Bulldog", then renamed "Walker Bulldog" after General Walton Walker, who was killed in a jeep accident in Korea in 1950. 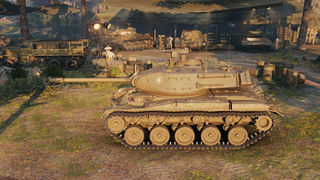 The M41 was an agile and well armed vehicle. On the other hand, it was noisy, fuel-hungry and heavy enough to cause problems with air transport. In 1952 work began on lighter designs (T71, T92), but those projects came to naught and were eventually abandoned. The Walker Bulldog saw limited combat with the U.S. Army during the Korean War, but for the most part, the conflict served as a testing ground to work out the tank's deficiencies, especially with its rangefinder. At the time, it was designated as the T41, and was rushed to the battlefield even before its first test run. This was due to the fact that the North Koreans were supplied with Soviet T-34 tanks, which were superior to the M24. By 1961, 150 were delivered to the Japan Ground Self-Defense Force to supplement their Type 61 medium tanks. 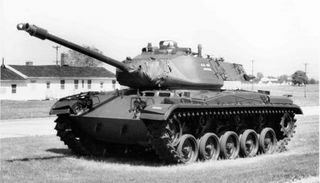 In 1969 the US Army began replacing the M41 with the advanced, but troublesome, aluminum hulled M551 Sheridan Armored Airborne Reconnaissance Assault Vehicle (not officially listed as a light tank due to Army policy at the time). The Sheridan's main gun could fire conventional 152mm tank shells and gun-launched missiles; the weapon could knock out main battle tanks. In addition, the M551 could swim and be air dropped. The chassis of the M41 was used for the M42 Duster, which mounted two 40 mm anti-aircraft guns. It was also built up into the M75 Armored Personnel Carrier, one of the first enclosed box-shaped personnel carriers; that vehicle in turn was the pattern for the M113 APC, which later became the most widely produced US armored combat vehicle in history. Also many of the drive train components, the engine the transmission and the auxiliary engine were used in the M44/M52 155mm howitzer. In 1964 the M41 light tank was selected to replace the Army of the Republic of Vietnam (ARVN) M24 Chaffee light tank, which they had inherited from the French, who in turn had received them from the United States during the First Indochina War. The first M41A3s arrived in January 1965, equipping five ARVN squadrons by the end of the year. The M41 was an instant success with South Vietnamese armor crewmen, who found its interior to be just perfect for their stature, which had been a principal criticism by US armor crewmen who had been assigned to the vehicle. This, combined with the tank's "mechanical reliability, simplicity, and excellent handling" made the Bulldog a worthy war machine. In 1971, the ARVN and US forces commenced Operation Lam Son 719, a disruption of North Vietnamese Army (NVA) supply lines in neighboring Laos; a combination of armor and airmobile attacks on three axes into enemy held territory. The ARVN 1st Armor Brigade, accompanied by two airborne battalions and two cavalry regiments penetrated approximately 4 miles into Laos on 8 February, enemy reaction was swift, with this first engagement between NVA and ARVN tanks, the 17 M41s knocked out 22 NVA tanks; six T-54s and sixteen PT-76s. Friendly units lost 5 M-41s and 25 APCs. By 1973, over 200 M41 light tanks remained in service with the ARVN. 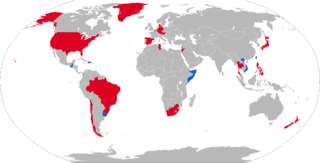 US units in Europe and CONUS equipped with the M41 Walker Bulldog eventually transitioned to the M48 Patton medium tank. M41A1 (1954): Hydraulic turret traverse instead of the electrical one. The more compact system allowed to increase 76 mm ammunition stowage from 57 to 65 rounds. M41A2 (1956): Production tanks with fuel injected Continental AOS 895-3 6-cylinder gasoline engine replacing the earlier carburator fuel system. This designation also applied to earlier M41s that had their engines upgraded to the fuel injection system. M41A3: M41A1 tanks that had their engines upgraded to fuel injection. M41 DK-1: Danish upgrade. New engine, thermal sights, NBC protection, side skirts. M42 Duster (1952): Self-propelled anti-aircraft defense weapon system based on the M41 chassis. Two Bofors 40 mm guns were mounted in the turret. Type 64 (Experimental): Taiwanese development modified to local manufacturing techniques with improved fire controls, a 520 hp diesel engine, co-axial machinegun replaced with T57 7.62mm GPMG, and applique turret armors and sideskirts. Did not enter mass-production and is not to be confused with another M42-based light tank conversion bearing the same designation. M41D: Republic of China Army upgrade. New locally produced gun, new targeting systems, Detroit Diesel 8V-71T diesel engine, reactive armor. M41C: Brazilian upgrade. In its final version, original gasoline engine replaced with Brazilian build Saab-Scania DS-14A O4 eight cylinder diesel engine with modifications to the rear hull and electrical system. Upgrade of the transmission package allowing for a top road speed of 70 km/hour. Night vision and a laser range finder added to the gunsight. Additional spaced armour added to the forward part of the hull, glacis plate and turret. Four smoke grenade dischargers were added to each side of the turret. Replacing the original 76 mm M32 gun with a 90 mm Ca 76/90 M32 BR3 gun with thermal sleeve and muzzle break made in Brazil. 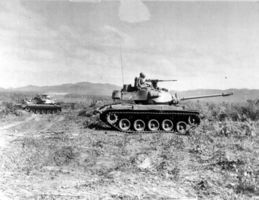 South Vietnamese M41 tanks during a training operation. 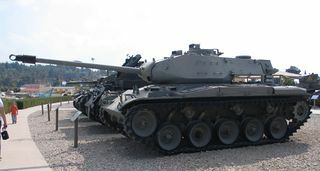 M41A3 on display at Israel's Yad La-Shiryon, armored corps museum. 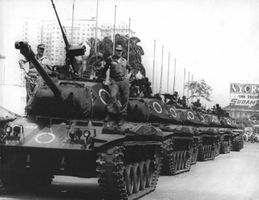 A column of M41 tanks along the streets of Rio de Janeiro during the Brazilian military government, 1968. The Walker Bulldog's actual top speed is 72.4 km/h (currently 68 km/h). This page was last modified on 27 November 2017, at 23:49. This page has been accessed 46,820 times.